She is the producer/director of Open Your Eyes a project about the Houtman-Abrolhos Islands. She has worked for the last 28 years on sustainable change, biodiversity and conservation integrating theatre, media and performance to tell stories. 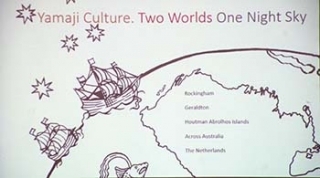 RM was the Director Kalbarri's Zest Festival and has also worked in the area of contested histories in the NW of WA. Open Your Eyes – Balayi is an opportunity to celebrate the heritage of the discovery of the Houtman Abrolhos Islands on 29/07/1619 – four hundred years ago. Balayi means 'watch out' in Yamaji. 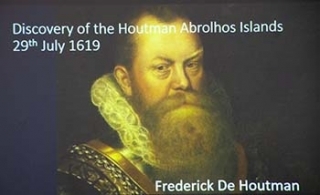 Frederick de Houtman and his brother were the first Dutchmen to sail to the Spice Islands (Indonesia). Initially they were imprisoned when they arrived and while in prison Frederick chartered the southern sky, recording the Southern Cross and also created a Dutch – Malay language dictionary. On his release from prison Houtman returned to Holland and then returned again to the Spice Islands. On his fourth trip he discovered what is now modern day Safety Bay/Rockingham. It was on this trip that he sailed north and discovered the islands that now bear his name. This trip also proved the existence of a large southern land (Australia). Vision of Open Your Eyes- Balayi is to attract three to five thousand visitors to our region to celebrate contemporary and historical cultures. To do this the intent is to have a specific celebration of Yamaji Culture which includes a national and international marketing program. A travelling exhibit will be taken to the Netherlands. Locally a range of 'unchartered experiences' are being developed which include seaside sculptures; nighttime projects; ABC TV documentaries; Duyfken and Leeuwin trips; Southern Cross star gazing; historical lectures; local school engagement; yacht races and a longboat expedition/exhibition up the Swan River. The above will be accompanied by Entice by Spice which is a gourmet lunch with celebrity chef Mark Olive. Plans are also afoot to build a larger than life Sea Monster. Ray H – Will you incorporate the Batavia story? Ian J – How do you pronounce Houtman … the ANSWER is HOWT not HOOT ! Vote of thanks by Ian Johnston.